The Japanese Patent Law has been reformed in 2006 regarding filing divisional applications after receipt of the decision of final rejection. Before the change, in the event that a decision of final rejection had been served, divisional applications could only be filed after an appeal trial against a decision of final rejection was requested, creating a burden on the applicant. The patent law reform has made it possible to file a divisional application without requesting an unneeded appeal trial against a final decision of rejection. 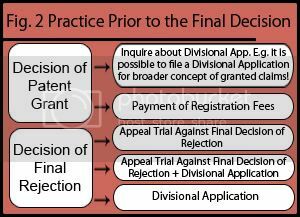 Please note that it is still also possible to file the divisional application with an appeal trial against a final decision of rejection. Again, although amendments are also possible at the time of an appeal trial, they can only be limited reductions, and therefore electing to file a divisional application will broaden the range for compliance. 1) The deadline is “30 days from service of the primary decision of final rejection,” and therefore filing a divisional application after receipt of a final decision or trial decision of rejection when the examination is returned to the examiner is not possible. 2) After the final decision is served, the extent that can be filed as a divisional application is that of the original application right before the filing of the divisional application. As mentioned in our previous report, this rule also applies to divisional applications filed after a decision to patent. Rather than the specifications at the time of filing, the later specification changed by amendments etc are the basis for the scope. In this respect, there is a content limitation for divisional applications after a final decision of rejection has been received, in comparison to divisional applications during the amendment period. 3) Regarding divisional applications, if an office action has already been issued for one application, the other application will receive a notification of its office action (figure 2). For example, if an office action is received for the parent application of a divisional application, the same rejections will be received for the divisional application; a provision under patent law article 50 part 2. When this notification is received, even if it is the first office action, the same amendment limitations as for the final office action are applied. This is a policy similar to a first action final in 35 U.S.C, and is a vital point to remember. To prevent this, it is necessary to confirm whether an office action has been issued for the parent application before filing a divisional application. This rule applies to both divisional applications filed during the period amendments can be made and those made after a decision of final rejection has been issued. 4) It is desirable to submit a petition when attempting to file a divisional application. The petition must explain that all requirements for filing a divisional application have been met. 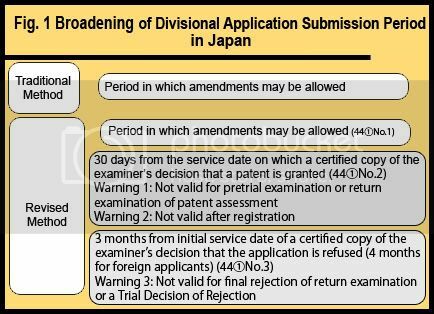 Although the petition is not imperative, because the requisites for filing a divisional application have become more strict, an order to produce documents under Japanese patent law article 194 part 1 will be issued if it is unclear whether all requirements for filing a divisional application have been met. In view of this, filing a petition may be considered a shortcut for a patent to be granted.